Here’s a special treat using Kytons Lamingtons and created by Bree May. Enjoy. How do you improve on Kytons Lamington perfection? You add berries! This simple and delicious Summer Pudding will be a festive showstopper at any gathering. Hull and slice the strawberries, then reserve ¼ of the strawberries for decoration and place the rest into a non-stick frypan with the blueberries. Add the sugar and vanilla extract and cook for 5 minutes over a medium heat. Turn the heat off and stir through half of the raspberries, reserve the other half for decoration. Transfer the cooked berries and their syrup into a cold dish and place into the fridge for 15 minutes to cool. Spray a 20cm x 10cm loaf dish with canola oil and line it well with cling wrap, making sure to extend the wrap over the sides as this will be used to enclose the pudding later. 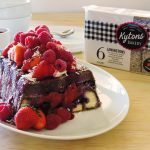 Slice the Kytons lamingtons in half horizontally. You should have 24 halves. Place 8 lamington halves, chocolate side down into the base of the dish, making sure to overlap the edges. Now starting from the short edge, arrange the remaining halves chocolate side out (2 on the short side, 4 on the long sides) overlapping each half with the next until all four sides of the dish are covered with a lamington layer. You should have 4 lamington halves remaining for the base of the pudding. Using a slotted spoon, carefully place the cooled berries into the centre of the pudding. Reserve the syrup for later. Arrange the remaining lamingtons chocolate side out over the fruit and then pull the clingwrap up over the top of the pudding, pushing it down lightly and enclosing it well. Place a heavy weight on the top of the pudding and then place the weighted pudding into the fridge for at least 6 hours or overnight. To serve: Turn the pudding out onto your serving dish and remove the clingwrap. Dollop over the cream if using and arrange the reserved strawberries and raspberries over the top with a scattering of shredded coconut. Serve with the reserved berry syrup. Tip: this dessert is best served within 24 hours of making it. Tip: for a more grown up version you can replace the water with your favourite liqueur.